The Senate and drug importation: A bill (S. 2328) sponsored by Senators Byron Dorgan (D-ND) and Olympia Snowe (R-ME) is yet another based upon the fiction that the Food and Drug Administration could set up a system to assure the safety of massive imports of prescription drugs from Canada and eventually dozens of other countries. The bill has bi-partisan support from people like Sen. Trent Lott who clearly need to be reminded that this is price controls by another name. Worse yet, the Dorgan-Snowe bill would create a new federal edict called ?compulsory sales.? The legislation would prohibit pharmaceutical companies from limiting sales to Canadian or other foreign Internet pharmacies at their price-controlled rates. Steve Entin of the Institute for Research on the Economics of Taxation says this is a ?taking? clause that would be a first step in nationalizing the pharmaceutical industry. Compulsory sales means, in essence, that the government would require companies to produce and sell their drugs at a fixed price, a violation of their ownership rights provided by patent protection. In addition to compulsory sales, the bill creates a 1% surcharge on drugs to pay for FDA enforcement ? an amount that the FDA says is woefully inadequate. The Congressional Budget Office released a study this spring that said that U.S. citizens would save only 1% on their prescription drug costs if drug importation were allowed. With the surcharge, the promised savings would be a wash. And for this, former New York Mayor Rudy Giuliani said at a hearing on Thursday that the bill would open our borders to the very real and present threat of infiltration by terrorists. Supporters will try to get a floor vote on the bill next week. Ceci Connolly of The Washington Post described in a front-page article June 5 what she finds to be a groundswell of support for Senator Kerry?s plan to have taxpayers pick up the cost of large medical bills for employers. The Kerry plan would have the federal government reimburse employers for 75% of the cost of employee medical bills exceeding $50,000. In return, the employers would be required to provide ?full? health coverage to all of their employees and implement disease management programs. Amazingly, Sen. Kerry insists: ?This is not a government plan.? In fact, this is another slippery slope to government control of health coverage.
? First, it is a back-door employer mandate.
? Second, it removes the incentive for employers to take responsibility in managing the care of employees with large costs. Once they hit the $50,000 threshold, they are off the hook.
? And third, it completely removes the concept of ?insurance? from health insurance. Real insurance companies price and manage the risk of high-cost events. This takes them out of that business and simply makes them bill processors for lesser expenses. The question to ask with the Kerry and the Dorgan-Snowe proposals is this: Does the legislation devolve more power to government or to individuals in the competitive marketplace? In both of these instances, the conclusion has to be that government wins. Finally, our tour of D-Day sites in Normandy last week was an extraordinarily moving experience. Douglas and I attended the June 6 commemoration ceremony at Omaha Beach where 9,387 soldiers are interred at the American Cemetery there. It truly is impossible to imagine the emotion you feel seeing thousands of crosses marking the graves of so many lost young lives. We also visited Pont du Hoc to see the impossibly high and steep cliffs scaled by the Army Rangers, and then on to Ste. Mere Eglise, the town where the first paratroopers landed soon after midnight on D-Day. The paratrooper jumps were reenacted during a 60th anniversary ceremony attended by Prince Charles. The biggest surprise of the visit was seeing hundreds of Europeans, mostly French citizens, racing around Normandy in beautifully-restored WWII Army jeeps and dressed in vintage U.S. soldiers? uniforms. They are re-enacting the 1944 liberation, and their joy over being freed from four years of Nazi rule still is very real and present. Somehow these citizens don?t seem to have gotten the word about European hatred of Americans. As a follow-up to my earlier newsletter, a cousin has put my father?s diary on the Internet, describing his B-17 missions over Europe in 1942 and 1943. Here?s the link to the most important document my father ever wrote http://www.greenshouse.com/Seaton_Diary_files/home.htm. While critics have pronounced the Medicare prescription drug discount card program a failure, an important new study by Joe Antos and Ximena Pinell of AEI shows that the evidence proves otherwise. They conducted a detailed comparison of available Medicare prescription drug discount cards and found that prices available on June 1 through the cards were 5 to 50% lower than prices offered by well-known discounters. The neediest seniors stand to save even more. Between June and December 2004, these beneficiaries could save between half and three-quarters of their prescription costs by taking advantage of a $600 taxpayer subsidy and special discounts made available by pharmaceutical manufacturers. For the drug card program to succeed, Antos and Pinell call for better consumer information, particularly on special discounts offered by pharmaceutical companies that can provide very generous savings to many low-income beneficiaries. The failure to make that information transparent and easy to access must be solved if this program is to live up to its full potential, they conclude. ?Democrats are the opposition party in Congress, and they?re supposed to raise questions,? writes Jeff Lemieux of Centrists.org. ?But discouraging seniors from enrolling in the drug cards is too much.? Lemieux argues that although the drug cards could be improved, they offer three important benefits: The cards are virtually free, they offer a $600 subsidy to low-income seniors, and there is no asset test to qualify for the $600 benefit. ?The average Martian would be justifiably perplexed about why the Democratic leadership wants to repeal a program that does no one harm, might actually help quite a few people, and offers a significant benefit to low-income seniors,? concludes Lemieux. ?Medicare prescription drug cards can cut costs by 30%. But confusion over the program may be hurting enrollment,? writes business correspondent Kathy Kristof in the LA Times. So far only 2.8 million of the 41 million eligible beneficiaries have signed up for the discount cards, and the majority of them were automatically enrolled by their health plans. She quotes Scott Parkin of the Access to Benefits Coalition as saying that enrolling in the drug card program is ?not easy, but it’s worth the effort. In some cases, the savings can equal thousands of dollars a year.” The cards may not be needed by all seniors, but ?depending on the drug plan and the type of medications the senior takes, the plans could provide significant savings ? particularly to those with no other drug coverage and a regular need for costly medicines,? writes Kristof. ?Failing to investigate the Medicare cards could prove a costly mistake.? A major study commissioned by the Stockholm Network, a London-based think tank, finds that Europeans are pessimistic about the future of their government health care systems. Two-thirds expect standards to decline unless major reforms are undertaken, and they believe that reform is urgent. ?The sense of urgency about reform is greatest among Europe?s working-age, taxpaying population, who are anxious about their future and impatient for change,? the study says. ?European healthcare systems are living on borrowed time?and will only worsen as time passes,? the study concludes. Unfortunately, only 7% of Europeans think that making it easier for people to spend their own money on health care will improve services. But by a 77% majority they think that giving patients more and better information about their illnesses will increase health standards. An initiative pushed by Sen. Hillary Clinton requires the government to perform ?comparative effectiveness? research and is one of the few items in the Medicare Modernization Act that ? [has] a great potential to go awry,? writes Carrie Gavora of the Stanton Park Group. Gavora warns of the dangers of comparative effectiveness research, which evaluates how one health care procedure or product compares with competitors to treat disease and illness. Gavora says the research could be used by government and other health care purchasers to limit access to care, especially for Medicare beneficiaries. Many seniors are likely to go without care if Medicare chooses not to cover a treatment they need because a ?comparable? one already is covered. Gavora says policymakers must recognize two truths about health care: ?One size does not fit all, and value is in the eye of the beholder.? She stresses that ?not all people with the same disease respond to the same treatment.? Researchers should focus on studying ?why this happens, having information systems that are capable of culling data to yield this information, and packaging that information so that it may be used to educate patients and better target resources can have a significant impact on the quality, and therefore the cost, of health care in America.? ?The last thing patients need is for the government to inject more socialism into their health care in the name of expanding coverage,? 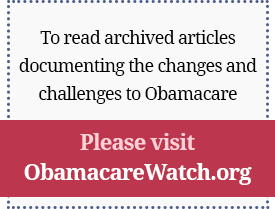 writes Michael Cannon of the Cato Institute in response to a USA Today editorial that advocated guaranteed access to health care. Through public programs and private regulation, ? [t]he federal government effectively socializes 86% of all health spending, a greater share than in 17 other industrialized countries, including Canada,? writes Cannon. He cites estimates by Harvard economist Martin Feldstein showing that ?the federal government’s quasi-socialization of private insurance alone will leave us nearly $200 billion worse off this year. Moreover, Chris Conover of Duke University estimates that health regulations will leave us $128 billion worse off ?The only way to make health care affordable is to get the government out,? Cannon concludes. For addition details go to: http://www.galen.org/eventrpts.asp?docID=643. Time for Faith-Based Health Insurance Plans? For additional details and registration information, go to: http://www.heritage.org/Press/Events/ev062404a.cfm.